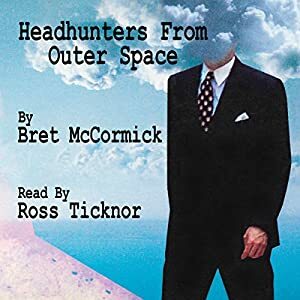 Book Review: Headhunters from Outer Space by Bret McCormick, Read by Ross Ticknor. Disclaimer: Bret McCormick is an editor for Road Kill. He gave me a copy of this audio book as a promotional. Headhunters is not my typical fair. I usually go for hard science fiction, space opera, or werewolves. However, I’m glad I listened to this book. If you are into pulp from the 50s and 60s, this book is going to be the one you keep under your pillow. Everything you would expect from the time period is here, though modernized to the year 2015: weird aliens, secret government agencies, incompetent cops, campy humor. If you’re looking for some lighthearted reading that doesn’t take itself too seriously (really now, the title should tell you that), then pick up this book. Writing was above average. There were areas where I tended to get bogged down in descriptions that could have been tightened up some. It didn’t take away from the story though.